US President Barack Obama has appointed Democratic Senator John Kerry as his next choice to be the new secretary of state. The Massachusetts senator was the former presidential candidate when he ran against former President George Bush in 2004. As the chair of the Foreign Relations Committee, Washington insiders believe that he has the diplomatic experience and relationship-building skills to succeed Hillary Clinton, the outgoing secretary of state. Kerry, a decorated Vietnam War veteran, replaced UN Ambassador Susan Rice as Obama’s pick for the top State Department post. It was her decision last week to withdraw her running for secretary of state in the face of strong Republican criticism that cleared the path to Kerry’s nomination. Many Obama supporters believe Kerry is an ideal pick, citing his diplomatic missions overseas in the past few years. Known for his personal, face-to-face style of diplomacy, Kerry was called upon by the Obama administration in recent years to carry messages and revitalize relations with countries angered by some of the US president’s actions. In Pakistan, for example, he was asked to repair Washington’s often-sensitive relationship with Islamabad after the raid that killed Al Qaeda leader Osama bin Laden in that country. He successfully repeated his diplomatic missions in Afghanistan and Egypt. 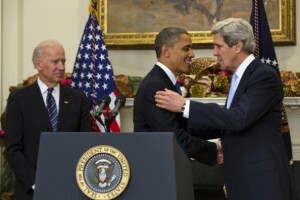 When announcing his nomination, Obama said Kerry’s career had prepared him for the top State Department role. “John’s played a central role in every major foreign policy debate for nearly 30 years,” Obama said. Political pundits in Washington, including Republicans, believe Kerry will meet no opposition during his Senate confirmation hearings and that he has all but secured the job.